We are still in the final stages of developing Wandering Heroes of Ogre Gate. Our play tests are going well and we are making some tweaks to a few key areas of the game. Things seem to be going as planned and we are hoping for a release sometime in the near future (we don't want to issue an official release date because we'd like to take our time getting things right). Soon I should have a post up about some of the changes we've made to things like Balance Points and other mechanics, but right now I'd like to talk about the role of the supernatural in the setting, particularly in light of how we've used it in recent playtest sessions. One thing to keep in mind is while there are a number of wuxia style films featuring things like Fox Demons and other elements of Chinese mythology, these are not strictly speaking, wuxia. Rather my understanding is they are a genre known as Xian Xia (which might be translated as immortal heroes). Wuxia has some supernatural features of its own but they are very specific. 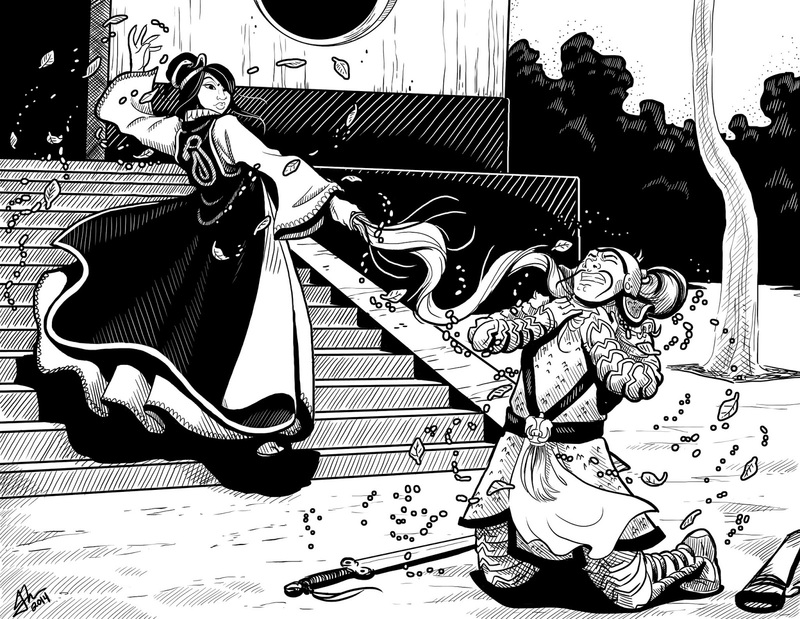 The reason I bring up this distinction is because people looking to run a wuxia-inspired campaign will often come from one of two camps: those deicing a more grounded, strict wuxia setting, and those who want more supernatural. You should be able to do either in Wandering Heroes of Ogre Gate. We tried to incorporate a lot of fantasy into the game because that gives the GM more options for adventure. So there are things like Fox Demons and immortals, for example. These are there because they serve as easy springboards to adventure. 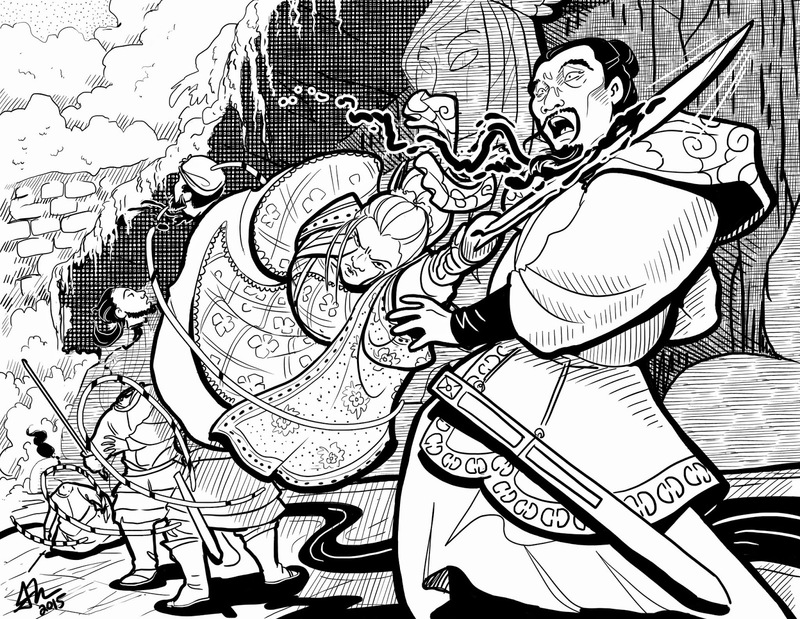 But the focus, the purpose of the setting, is wuxia, so we try to keep the supernatural stuff peripheral, things you can draw in as needed if your running Wandering Heroes of Ogre Gate or ignore. In my own Wandering Heroes of Ogre Gate campaign, I tend to alternate. 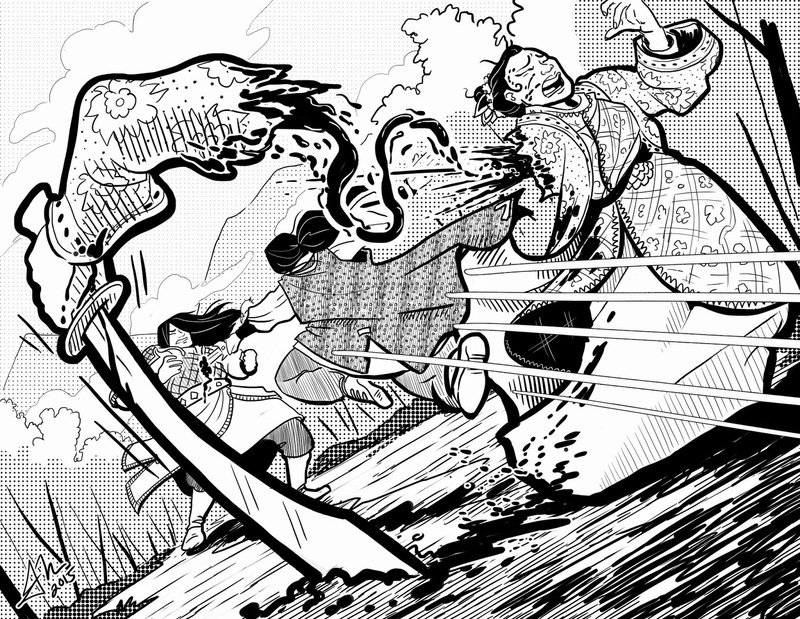 I usually do a few character focused sessions that are straight wuxia. These are typically adventures that deal with conflicts between sects, quests for manuals containing powerful Kung Fu Techniques, etc. But I mix this up with an occasional Fox Demon or ghost adventure. For me, this works because overall it has the feel of Return of Condor Heroes but I have the flexibility I need to keep things interesting for the players when they need a change of pace. It also means, if I want to do dungeon crawls, I don't have to limit myself to traps, riddles and human foes; I can throw in monsters as well. I think this makes for a richer campaign overall. To use some examples this means you can run something like Come Drink With Me or The One-Armed Swordsman but also pull off Painted Skin or Zu Warriors from the Magic Mountain. In the end, I think it is about having options as a GM. If you follow our most recent playtest reports (HERE) you can see this has led to some interesting places. The party is largely concerned itself with sect conflict and finding something called the Phoenix Crown of Bao. But they also encountered talking monkeys, immortals and are presently chasing after a fox demon. For us this is working out very well, and for me personally I find I am able to draw on the kinds of sources that interest me. In the next couple of days I should have some updates on the system itself. 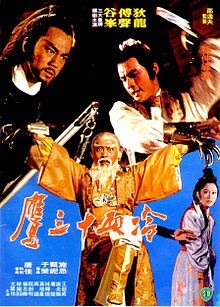 Released in 1978, The Avenging Eagle is a Shaw Brothers film about redemption and revenge. Directed by Sun Chung, the movie stars Ti Lung (Chik Ming Sing), Alexander Fu (Cheuk Yi Fan), Shih Szu (Siu Fung) and Ku Feng (Yoh Xi Hung). The structure of the The Avenging Eagle is interesting, using several long flashbacks to tell the story of Chik Ming Sing (also known as Rover or as Black Eagle). It begins in the desolate wastes of a frontier, with the main character dying of thirst and hunger. He encounters a man who says his name is Homeless and gives Chik water. Their friendship is rocky at first but they eventually become close, with Chik Ming Sing revealing that he is wanted by a group called the Iron Boat Gang, having been raised as a killer by their heartless master Yoh Xi Hung. An orphan, Chik Ming Sing never learned to discern right from wrong. The Iron Boat Gang master taught his students to be ruthless and punished them for displays of affection toward each other. We learn that after the gang tried to heist a shipment of cargo going to Nu Fai Town, Chik Ming Sing was wounded by the hero Golden Spear and forced to flee into the wilderness. There he lost consciousness and was brought to the villa of a man who calls himself Jiang Shun Kwai. Brother Jiang's family nurses Chik Ming Sing back to health and his sister, Siu Fung wins the Iron Boat Gang Disciple's heart. Through her he learns about right and wrong, begins to question his upbringing and wants to become a better man. His return to Iron Boat Gang does not go smoothly, as Chik Ming Sing fails to wear his iron plaque (which symbolizes his membership in the gang). This infuriates Yoh Xi Hung, who seems to view him as a favorite disciple. Later, Yoh Xi Hung informs him that they have found his nemesis, Wang An. Chik Ming Sing goes with his brothers to kill Wang An and his entire family only to learn that Brother Jiang and Wang An are the same man. He tries to stop the Iron Boat Gang from killing the residence of the villa and attempts to protect Siu Fung, but his brothers overpower him and murder the entire family. Yoh Xi Hung has him beaten for his insolence, but eventually forgives his disciple once again. However, in his heart Chik Ming Sing is no longer a killer and when they go to the house of Cheuk Yi Fan (another nemesis), once again murdering the entire family, the Iron Boat master forces him to kill Cheuk's pregnant wife. Feeling he has no choice, Chik Ming Sing kills her but silently vows to leave the gang. The recounting of his past occurs as Chik Ming Sing and Homeless travel together and avoid the Iron Boat Gang, who are tracking him. In between flashbacks they are attacked by groups of Iron Boat disciples, in spectacular and bloody combats. During one such encounter, we get a glimpse of Homeless' true identity when he takes out twin blades and fastens them to his forearms. Cheuk Yi Fan is also known as Double Sleeve Blade: Cheuk Yi Fan. The audience realizes who he is, that Chik Ming Sing has killed Homeless' wife and that homeless is Cheuk Yi Fan questing for vengeance. However he seems to have softened his view of Chik and appears to forgive him when he reveals the truth about how his wife died. The two team up to fight the Iron Boat Gang and kill its cruel master. First they ambush some of their trackers at an inn. This is a cleverly arranged scene where the heroes force the Innkeeper to rent them the entire building temporarily so they can dress as the staff and ambush their enemies. When the Iron Boat disciples arrive they are taken by surprise and killed one-by-one. Chik and Cheuk/Homeless decide to attack Yoh Xi Hung together and assault the Iron Boat headquarters. They cut their way through the master's minions and face off against his two chief bodyguards: twins who are each missing an arm and fight together as one with a shield and round saw blade. 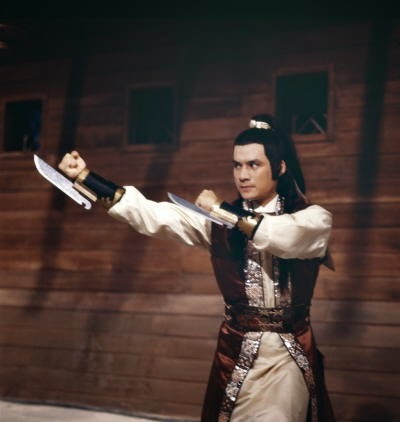 When they finally confront Yoh Xi Hung, he tries to turn Chik and Cheuk against each other by offering his disciple forgiveness if he joins with him in the battle. At first this seems to work. Chik abandons his search for redemption and accepts his master's deal. However he changes his mind again mid-fight and helps Cheuk kill Yoh Xi Hung. After the battle Chik asks Cheuk to take revenge for his wife, but he refuses, saying they are not enemies. However Chik insists saying that Cheuk's wife's spirit will never have peace if he fails to avenge her death. He grabs Cheuk's arms using his blades to commit suicide, effectively forcing him to take revenge. At the need of the film Cheuk stands over his wife's grave and it goes to the end credits. Like Killer Clans and The Last Hurrah For Chivalry, this is a film that focuses on the dark side of the Jianghu. Whereas The Last Hurrah is a celebration of brotherhood and true friendship, The Avenging Eagle highlights the corrupting influence of brotherhood in the form of the Iron Boat Gang. Still it is more optimistic I think than either film because there is a balance of forces. The protagonist belongs to an evil martial sect, but there are clearly lots of good people who populate the setting as well, Wang An and Golden Spear for example. If the viewer feels overwhelmed by the evil and cruelty it is only because we are seeing the world from Chik Ming Sing's point of view. The Avenging Eagle features one of the meanest, nastiest, most heartfelt villains ever. He raises his students to be devoid of affection for one another but demands absolute loyalty from them and appears to desire genuine filial devotion from his students (when Black Eagle forgets to wear the iron plaque that Yoh Xi Hung made with 'his own two hands' the Iron Boat Chief gets very emotional and clearly takes it personally). There is just a very interesting contradiction in this character. Ultimately Yoh Xi Hung is the source of evil and of Chik's suffering. Even though Chik has killed his wife and unborn child, Cheuk Yi Fan appears to understand that his actions were a product Yoh Xi Hung's evil. Cheuk is able to have compassion for Chik because he expresses genuine remorse and achieves an understanding of right and wrong (which he didn't possess before). The swordplay is classic late 70s Hong Kong action. This is the sort that is highly stylized and what I describe as 'blocky and choppy' with staccato movement and frozen poses after each strike. In my view this is pretty impressive fight choreography within that style. One of the great things about The Avenging Eagle is the sheer number of weapons. This gets into Legendary Weapons of China territory with every combatant seeming to wield a different killing tool. There are axes, shield, saw blades, three section whips, iron claws and more. The fights are all great but for me the Inn sequence and the final battle are worth singling out as exceptional. For the inn this was largely due to the set-up, which was a lot of fun. Wuxia seems to reward cunning plans and this was definitely a good cunning plan. The final confrontation with Yoh Xi Hung had excellent choreography but more than that it really managed to work drama into the fight. For gaming I think there is some fodder here. It gets into the idea of security companies and shipments begin hijacked by bandits. In my wuxia campaigns those kinds of scenarios are pretty standard. The twist here is rather than protecting the goods, the protagonist is taking them. Yoh Xi Hung would make a top notch villain in any campaign. The Iron Boat Gang by extension would work as well. This is also the kind of film that can help a GM get a sense of the inhabitants of the martial world. You have the contrast of Brother Jiang and his family with the Iron Boat Gang, and that can be useful for populating your map. What stands out for me is the simplicity of The Avenging Eagle. The flashback structure gives it the illusion of greater complexity but the storyline is beautifully straightforward. Definitely worth checking out. In another post I talked about maiming (Here: It is All Fun and Games Until Someone Gets Maimed). As an outgrowth of that, I'd like to address the issue of stakes in a Wandering Heroes of Ogre Gate campaign and how I telegraph them, so the players know what consequences are fair game. To use the maiming rules as an example, I wanted to indicate to the party early on that losing limbs was a possibility because I didn't want to blindside them. Not every game allows for going blind or having your arm cut off, so it seemed fair to me to illustrate that it was on the table at the start of the campaign. This is one of the reasons I introduced the NPC One-Armed Fiery Demon. 1) Maiming exists and can happen to you: My hope here was that by bringing in a character first thing that is missing an arm, the players would realize that maiming is a thing in the setting. It might not happen to everyone but heroes do suffer permanent consequences from fighting. 2) People more powerful than you exist in the setting and if you don't respect that power, you can die: One of the first things One-Armed Fiery Demon did when the party met her was decapitate a group of eight Mystic Sword Sect disciples in one swoop of her blade. The purpose of this wasn't to have them watch my cool NPC do something the players can't do (we've all probably had a GM lord optimized or broken NPCs over us and that is never fun). The point here was to show that there are people way more powerful than them in the setting and that they can kill you in an instant if you are not careful. 3) Grudges are a thing in the setting and if you anger the wrong person, it may come back to haunt you or your sect: One-Armed Fiery Demon wasn't just randomly killing people, she had a grudge with the Mystic Sword Sect. This was important because the game has grudge tables and grudge encounters happen. The more grudges players acquire, the more they get stuck in an endless cycle of bloodshed. I wanted them to realize this kind of stuff can affect them. As the campaign progresses the party has had more and more interactions with One-Armed Fiery Demon and she even became the informal Sifu of Zhi Zhu (a PC in the campaign). They've learned her real name is Min and that ten years ago Lady White Blade of Mystic Sword sect cut off her arm and killed her husband. So she has also been useful giving some background to the setting as well. But she isn't the only character or event I used to telegraph consequences. There are others who have been used to demonstrate what is at risk in the game. The reason I think this is useful is because so many GMs have different styles when it comes to what consequences are on the table and so many games are different. Not every GM kills PCs for example. I am not particularly harsh, but I also do take a bit of a 'let the dice fall where they may' approach, while trying to be fair and open in the process. 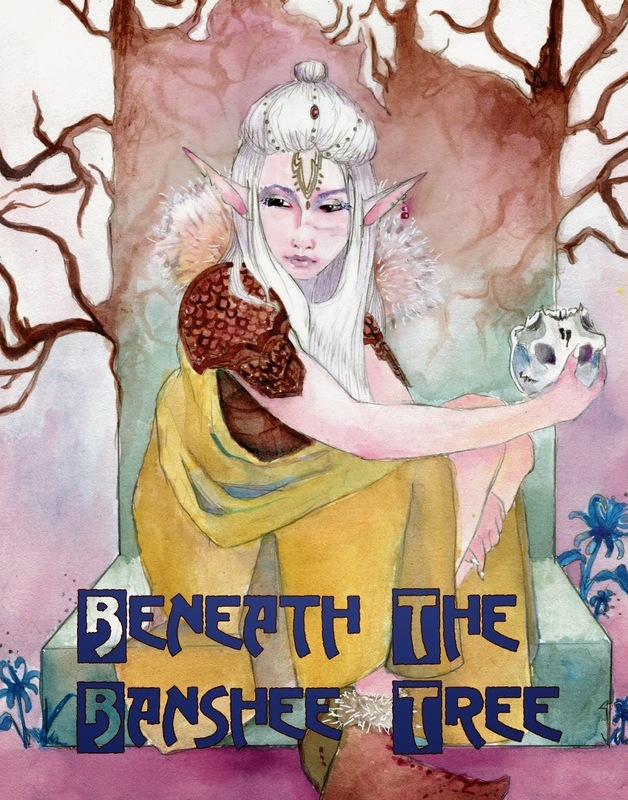 Magic and mystery come alive in Beneath the Banshee Tree, a sorcery-infused investigative adventure for the Sertorius roleplaying game. We are pleased to announce it is available in print for $14.99. Powerful spellcasters called Sertori come from every corner of Gamandria to the mountain city of Talyr , answering the king’s call for new talent to fill important offices. However his invitation attracts someone with sinister motives who exploits the abundance of magic to enact an unthinkable scheme. After a series of mysterious events the players are recruited to solve the puzzle and weed out the evil presence in Talyr. But it is a race against time as they hunt for clues and try to piece them together before something terrible unfolds. This 69-page investigative module comes with an adventure, several detailed NPCs, a city map, a full description of the city of Talyr, and a unique investigative structure that makes for a different experience each time you play. For use with the Sertorius rulebook by Bedrock Games: AVAILABLE HERE. I've been GMing since about 1990. This is surprising because that is 25 years and it certainly doesn't feel like it. Not just in terms of time, but also experience. I still don't feel like a veteran GM. If I am completely honest, I am probably about average as a game master. I have my good sessions, I have my not-so-good sessions, but most are somewhere in the middle. I don't feel like one of these referees who's cracked the code. Roleplaying spotlight: One of the characters really got to shine this session and that had a big impact on the player's ability to get into character and explore her personality. Another character had a moment in the sun when she helped the group find a pit of jade. The session had all the right elements: The player liked that the session hit a lot of notes and felt packed with a bunch of different components. It included a quest to retrieve the Phoenix Crown of Bao, exploration of a Jade Mine, the interference of a rival martial hero who ambushed them at an inn, an environmental challenge in the form of a difficult cliff, the emergence of a new threat and a daring escape and challenge. The pacing: One player commented that the flow of the session felt right. In this case, everything just kept moving at a steady clip. The setting came alive: There was a sense that the world was real, that stuff was happening elsewhere and that could have an impact on them. When they randomly looked into some nearby woods, they found people mining a Jade Pit, and this opened up to a whole interaction with local villagers who clearly needed protection before bandits or warlords discovered the resource. Someone also really liked that an inn they stayed at had a dish called Longevity Duck, and it actually provided a small mechanical bonus to the Reason Skill for a few hours (clearly the innkeeper was exaggerating when he said it made you live for 1,000 years, but the player still liked getting the bonus). Zhi Zhu's sifu demonstrates "Spinning Steel"
NPCs came alive: They liked that the NPCs had their own goals and this led to some complex, not very straightforward, interactions. There are a number of different NPCs in play and they keep intersecting with them in different ways. The mechanics: The game mechanics just seemed to work very well this session. The battles all felt like real martial arts battles, but the mechanics didn't get in the way. They faded into the background and let us focus on the the characters. Background: The players have been learning bits and pieces of the campaign background as they interact with different people. This session they learned more about Zhi Zhu's Sifu and about the Phoenix Crown when they went to Heiping. This slow ladling of information from different sources seems to be building a strong interest. Accomplishments: The players accomplished a lot this session. So these are the things, according my players, that caused them to enjoy the session. I may be missing some bits, as they each gave me quite a few paragraphs and I had to reduce them to a few basic points here. Personally I think much of this is due to the genre itself, and this particular session, we've just seen a lot of the wuxia elements culminate into something interesting. A lot of it was also luck. The players had a lot of lucky rolls this session, which made for a number spectacular successes. I think it was one of those things where all the elements of play just kind of came together and made for a fun night of gaming. Ultimately I think this is a case of it really coming down to the players as well. Everybody was taking initiative and that goes a long way toward making a session enjoyable. I think there is a temptation to say, how do I make sure this happens every session. But I think that would be a mistake. If this happens every session by design, it loses its luster. But I think the potential for this should always be there and I do think it is important to learn from the good sessions so they are more likely to recur. I'll be keeping an eye on this aspect of Wandering Heroes of Ogre Gate as the campaign continues. In wuxia characters get maimed all the time. In some instances these are crippling injuries that completely remove them from being active in the martial world, but in others these are challenges that shape their character and require them to develop a new and interesting approach to fighting. Fang Kang (The One-Armed Swordsman) and Yang Guo (Return of Condor Heroes) are both examples of the latter. Yang Guo's injury is especially shocking because it happens well into the story, after he has become a great martial hero with magnificent Kung Fu. Suddenly he seems to lose it all, only to improve under the guidance of a condor who teaches him to wield the large Iron Sword of Dugu Qiubai. Personally I've come to identify strongly with these kinds of characters and I tried to bring some of that into the game with our Maiming, Combat Techniques and Flaws rules. However I also didn't want to gloss over the brutality of maiming because it really punctuates the potential cost of being a martial hero. So there is a real price to pay if you lose a limb or two (at least initially). To attempt to maim a target, declare your intention to do so on your attack. You make your attack at a -1d10 penalty as per the Targeted Strike rules. If you succeed and if you get two Total Successes on your Damage Roll, you may maim the foe as desired (blinding, chopping off their arm, etc). The individual so affected should then take the relevant flaw (Blind, Missing Limb, etc). 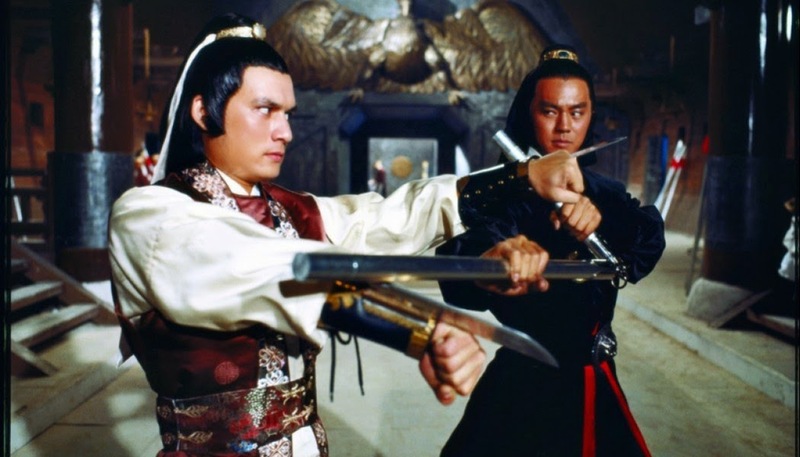 While maimed characters in wuxia often find their Kung Fu is weaker initially, in some cases they adapt and turn a perceived weakness into a strength. This is one of the reasons I personally find characters like the One-Armed Swordsman so appealing. We tried to incorporate this into the game itself. There are Combat Techniques available only to characters with flaws like Blind of Missing Limb. These are relatively minor bonuses to particular situations or a reduction of the penalties they would normally incur. However there are also Kung Fu techniques that only they can use effectively. So a Blind Character might take the Blind Swordsman Combat Technique, which will effectively put her at an advantage against others in dim lighting conditions. She could also take the Blind Strike Kung Fu Technique which allows her to use hearing to target opponents and then strike them. Beyond that, when characters become masterful martial heroes, they can take a Kung Fu Technique called Adaptation of the Maimed, that eliminates all penalties incurred from Missing Limbs or other such losses. However we built Wandering Heroes to be flexible. Gamemasters and Players are encouraged to go beyond the Kung Fu Techniques listed in the rulebook, making their own to suit their vision of what is possible. So these are just viewed as starting points for such characters.